Hinode spacecraft captured this picture of our sun's chromosphere on Jan. 12, 2007. A huge energy- and light-producing sphere of glowing gases, the sun makes life on Earth possible. The temperature of our nearest star varies tremendously, and not in ways you might realize. At the core of the sun, gravitational attraction produces immense pressure and temperature, which can reach more than 27 million degrees Fahrenheit (15 million degrees Celsius). Hydrogen atoms get compressed and fuse together, creating helium. This process is called nuclear fusion. Nuclear fusion produces huge amounts of energy. The energy radiates outward to the sun's surface, atmosphere and beyond. From the core, energy moves to the radiative zone, where it bounces around for up to 1 million years before moving up to the convective zone, the upper layer of the sun's interior. The temperature here drops below 3.5 million degrees F (2 million degrees C). Large bubbles of hot plasma form a soup of ionized atoms and move upward to the photosphere. The temperature in the photosphere is about 10,000 degrees F (5,500 degrees C). It is here that the sun's radiation is detected as visible light. Sunspots on the photosphere are cooler and darker than the surrounding area. At the center of big sunspots the temperature can be as low as 7,300 degrees F (4,000 degrees C). 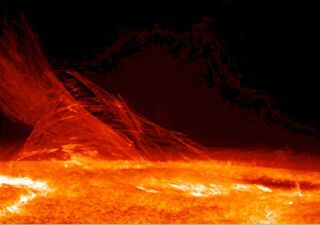 The chromosphere, the next layer of the sun's atmosphere is a bit cooler — about 7,800 degrees F (4,320 degrees C). According to the National Solar Observatory (NSO), chromosphere literally means "sphere of color." Visible light from the chromosphere is usually too weak to be seen against the brighter photosphere, but during total solar eclipses, when the moon covers the photosphere, the chromosphere can be seen as a red rim around the sun. "The chromosphere appears red because of the large amount of hydrogen present," the NSO says on its website. Temperatures rise dramatically in the corona, which can also only be seen during an eclipse as plasma streams outward like points on a crown. The corona can get surprisingly hot, comparable to the body of the sun. Temperatures range from 1.7 million degrees F (1 million degrees C) to more than 17 million F (10 million C), according to the NSO. "The corona is incredibly hot, hundreds of times hotter than the layers below," Bernhard Fleck, a European Space Agency project scientist for NASA's Solar and Heliospheric Observatory (SOHO) said in a statement. "Since the sun's source of energy is at the center, on a simple level, we would expect the corona — the outermost layer — to be the coolest." SOHO is just one of several solar missions exploring this and other mysteries. As the corona cools, losing heat and radiation, matter is blown off as the solar wind, occasionally crossing Earth's path. "Thanks to SOHO, there's a growing public recognition that we live in the extended atmosphere of a magnetically active star," SOHO project scientist Joe Gurman said in the same statement. The sun is the largest and most massive object in the solar system. It is about 93 million miles (149.5 million km) from Earth. That distance is called an astronomical unit, or 1 AU, and is used to measure distances throughout the solar system. The sun's light and heat takes about eight minutes to reach us, which leads to another way to state the distance to the sun: 8 light-minutes.